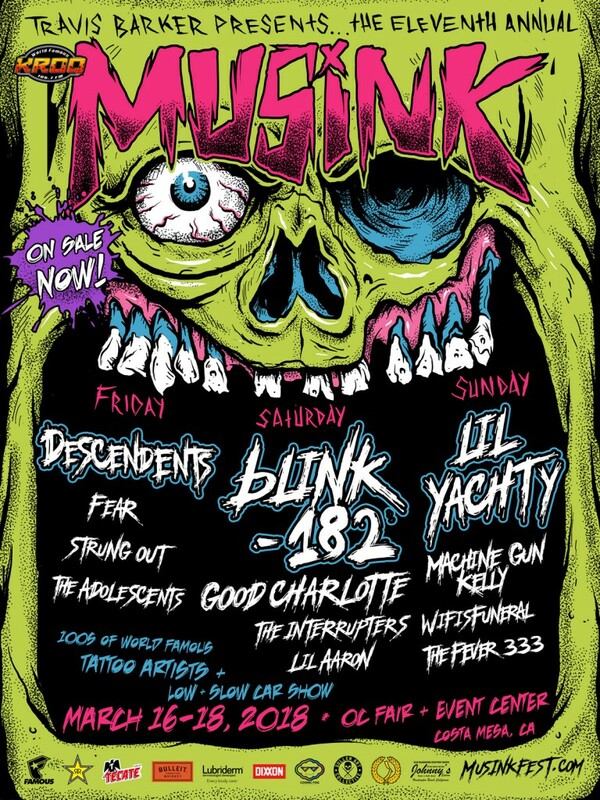 As the premier festival bringing together the best of music, tattoos, and cars, Travis Barker’s MUSINK, presented by KROQ, returns to the OC Fair & Event Center in Costa Mesa, CA Friday, March 16, Saturday March 17 and Sunday, March 18for its 11th year. The event will feature hundreds of world-renowned tattoo artists, music performances from top rock, punk and hip hop artists including blink-182, The Descendents, Lil Yachty, Good Charlotte, Machine Gun Kelly, Fear and more, as well as the Low ‘N’ Slow Car Show (presented by Travis Barker‘s Famous Stars and Straps). Travis Barker’s MUSINK also features daily tattoo contests, a vendor village, and the Miss MUSINK competition (presented by Sullen) at one of the world’s biggest gatherings of elite tattoo artists. Famous Stars and Straps presents Low ‘N’ Slow Car Show returns to MUSINK and will feature the best selection of custom rides, American classics and lowriders in Southern California on display, all handpicked by Travis Barker. The 2017 MUSINK—the 10th annual event—had over 20,000 in attendance and received rave reviews from the media. Tattoo.com said, “Music, ink, and cars are the trifecta of epic, and it is also MUSINK in a nutshell” [March 18, 2017]. Elsewhere, AXS.com proclaimed, “The event has emerged as the largest tattoo and music festival in the nation” [March 20, 2017]. MUSINK hours are 3:00 PM – 10:00 PM on Friday, March 16, 12:00 PM – 10:00 PM on Saturday, March 17, and 12:00 PM – 9:00 PM on Sunday, March 18. MUSINK partners include: Famous Stars and Straps, Rockstar Energy Drink, Tecate, Bulleit Frontier Whiskey, Golden Crown Barber Shop, Dixxon Flannels, Cosmic Fog, Sullen, and Johnny’s Saloon in Huntington Beach.